Stopping to fill up his car on his way to work, Jeff Seibenick caught something he said many people might miss: a gas pump that wasn't pumping. Seibenick said he could feel something wasn't right, and quickly took out his cellphone to capture what was happening at the pump at an Arco station in Hollywood. "I was like, man this is crazy. This is weird," he said. "I should probably film it because nobody's going to believe me." His video shows the meter quickly rising, even as he removes the nozzle from the car. Nothing came out. "It went up pretty fast," he said. "What am I paying for? Am I paying for gas or am I paying for this pump mechanism?" Approximately 1 percent of gas pumps in Los Angeles County fail their tests and have to be recalibrated, according to Larry Nolan of the LA County Department of Weights and Measures, which regulates all pumps. In a city of approximately 60,000 gas pumps, that means about 600 pumps a year need to be recalibrated. NBC4's I-Team showed Seibenick's video to Nolan. "It's the worst case I've ever seen," he said. Nolan said when his department finds a broken or inaccurate meter, they will red-tag it and place it out of service until it can be repaired and retested. Additionally, the gas station may be fined if a gas station does not take immediate action to fix its broken pumps. 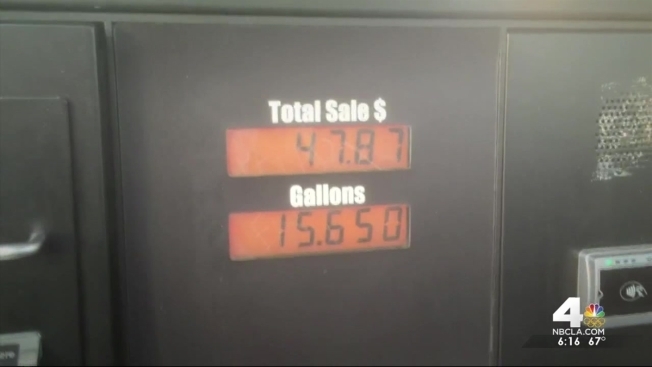 Just how far off can the meter on a gas pump be? Generally, state law requires pumps in operation to be 99.4 percent accurate. Any less than that and the pump should not be in operation. Seibenick asked for his money back immediately, but says he'll be on the lookout in the future. "The next time I go pump gas you better believe I'm going to be watching it," he said. "I'm going to check the price. I'm going to do a little math." The gas station owner did not respond to the I-Team's requests for specific comment, but the manager said the pump has been fixed.